By the year 2050, more than two-thirds of the world’s population will live in cities. Cities are primary drivers of economic, cultural and political advancements and, as such, require vast quantities of the world’s resources – today, cities generate more than 70 percent of global greenhouse gas emissions. If humanity is going to avoid catastrophic climate change and build a prosperous low-carbon future, action must be swift. While the Paris Agreement was a breakthrough, it doesn’t come into force until 2020, by which time emissions need to have peaked. National government commitments only add up to about 40 percent of what is needed, which is why the focus must also be on non-state actors, including cities. As cities continue to grow while facing escalating natural and manmade pressures, one of the great challenges they must address is meeting infrastructure and service demands in a sustainable, low-carbon way. 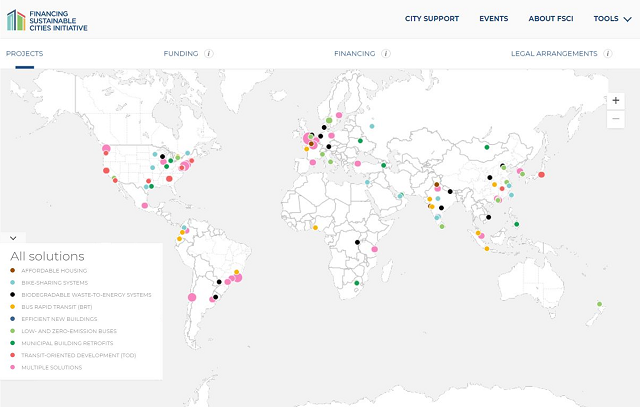 A new suite of tools from the Financing Sustainable Cities Initiative (FSCI), a partnership between C40 Cities Climate Leadership Group and WRI Ross Center for Sustainable Cities funded by the Citi Foundation, aims to change that. The financing challenges in cities are acute: by some estimates, cities and countries are falling short on urban infrastructure needs by some $1 trillion every year. Getting cities on track to sustainability not only requires more resources but smarter deployment of those resources and more innovative solutions. Sustainable urban projects are most susceptible to stalling at the idea stage, not because of a lack of commitment, but because cities don’t have a clear plan of action and enough concrete examples of how to successfully approach these types of projects. The FSCI’s new suite of web-based tools helps cities take the crucial first step of moving new projects from aspiration to action. The web-based portal indexes and maps sustainable urban projects from around the globe into eight high-impact solution areas, from electric bus fleets to bike-sharing systems. 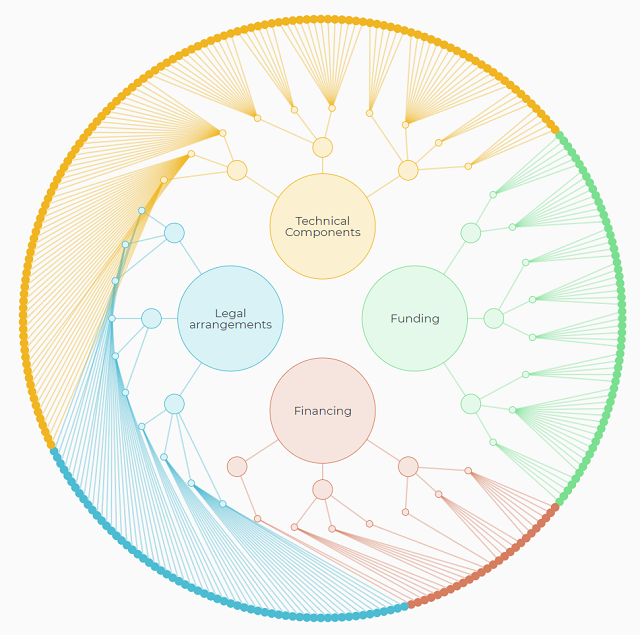 The platform’s Explore tool provides access to a catalogue of more than 150 investments made in more than 80 cities, including information about a project’s funding source and long-term financing, as well as a description of the physical assets, contracts and political frameworks put in place for implementation. By identifying the elements of successful solutions, city officials and decision-makers can learn what’s worked, where and why. Imagine a city that has been struggling with high levels of congestion and air pollution as more and more private vehicles take to the streets, a trend affecting many urban areas. Through a quick search, senior officials might find Bogota’s hybrid bus project, where a mayoral decree in 2013 led to two operators purchasing 300 low-emission buses to provide cleaner public transit service. The vehicles, which were financed by the Inter-American Development Bank, consume up to 39 percent less fuel than conventional buses and emit 39 percent less carbon dioxide. The platform’s Design tool allows decision-makers to take the next step to conceptualizing a project for their own city. With a guided tutorial, users select a solution and elements of projects relevant to their situation. The tool then creates an easily printable and downloadable overview page, helping to translate lessons from successful projects into an actionable plan for what to do next. The platform not only helps cities understand what it possible but how to do it. Since its creation in 2015, FSCI has engaged with more than 100 cities to help them accelerate and scale-up investments in sustainable urban solutions through innovative business models. Each city has its own set of unique conditions, but by providing local officials with an easy way to present their ideas to colleagues, investors or other urban professionals, the FSCI helps bring ideas to reality. We need a smarter approach to channel ideas into tangible outcomes. FSCI partners are proud to provide resources that can help cities meet their urban development goals through trainings, workshops and tools like FinancingSustainableCities.org. We aim to create a thriving community of decision-makers interested in finding new ways to improve lives and the built environment. We invite you to explore and tell us what you think. The Financing Sustainable Cities Initiative (FSCI), funded by the Citi Foundation, is a partnership between WRI Ross Center for Sustainable Cities and C40 Cities Climate Leadership Group that helps cities accelerate and scale-up investments in sustainable urban solutions through the development of innovative business models.